The flight is punctual and the attendants sharp. Birthday guests are on board and we all enjoy a free copy of the Herald Newspaper in which Air Zimbabwe has dedicated a full-page of best wishes to ‘His Excellency’. 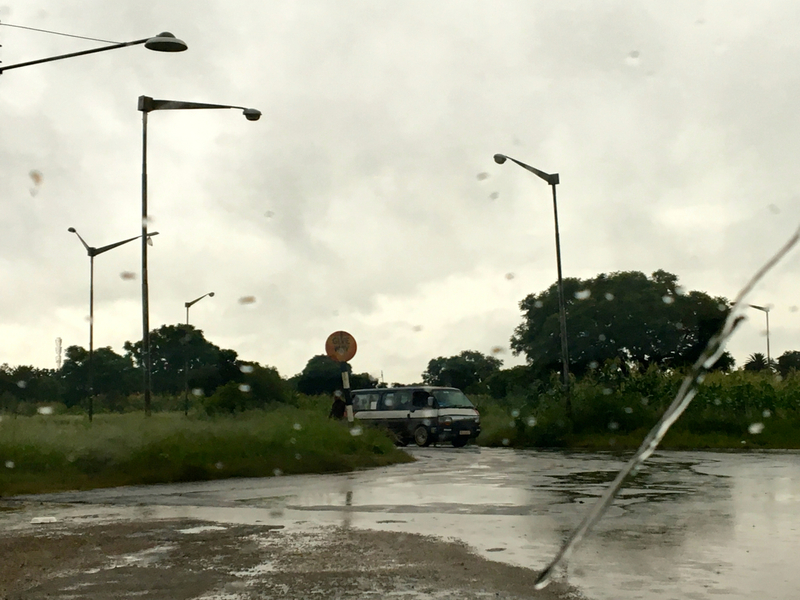 The airport shuttle takes about twenty minutes to reach Bulawayo itself. The road, lined for miles with nothing but trees, is in good condition and the one roadblock waves us through without a second look. It’s a modest approach to the centre of town. 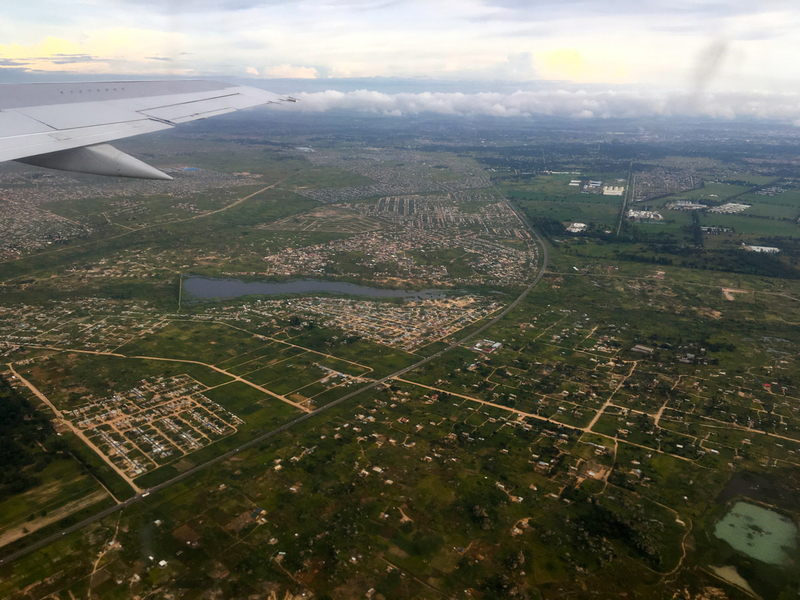 I expect an elegant city, with wide, treelined avenues – superior in some way to Harare. 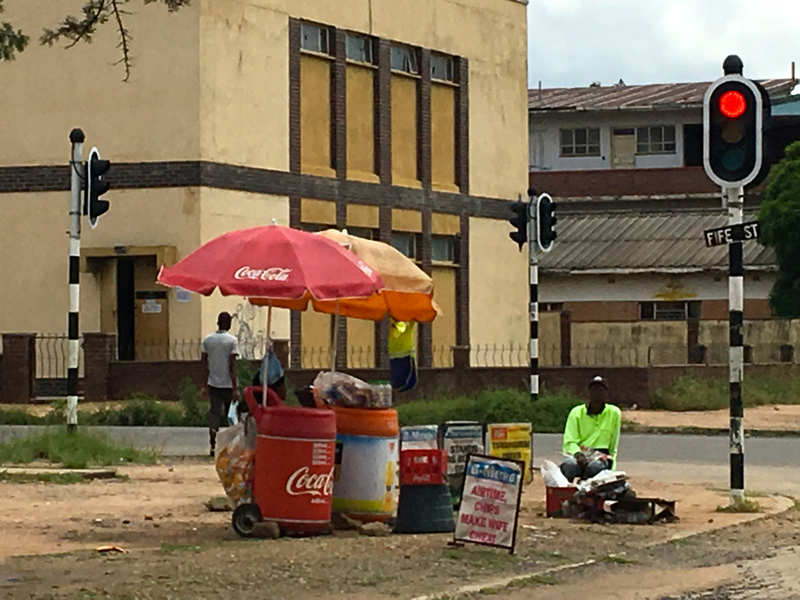 This is the ‘city of kings’ – where Lobengula had his kraal, where he and his people clashed with British troops during the Matabele War of 1893 – a city of legends. Yet, in the damp grey, it doesn’t feel like it. The streets are wide and the buildings have style but they look starved of energy, of anything new. I meet my friends in a hospitable, book-filled cafe and then we set off to meet others and to explore. 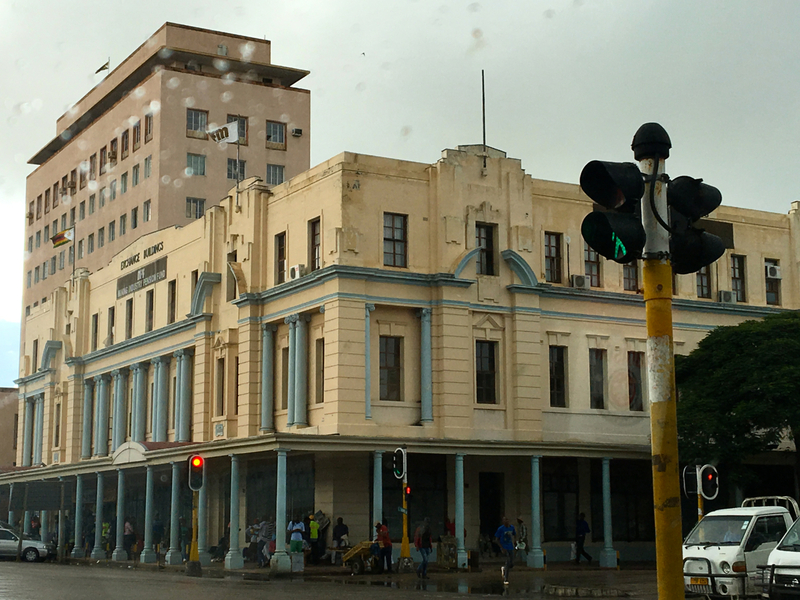 Bulawayo is different to Harare, it always has been, but what I notice is that compared to the capital, there is a lack of shiny new-builds, of confidence, of energy. On the surface it looks under-invested, as though the city has somehow shrunk inside itself. 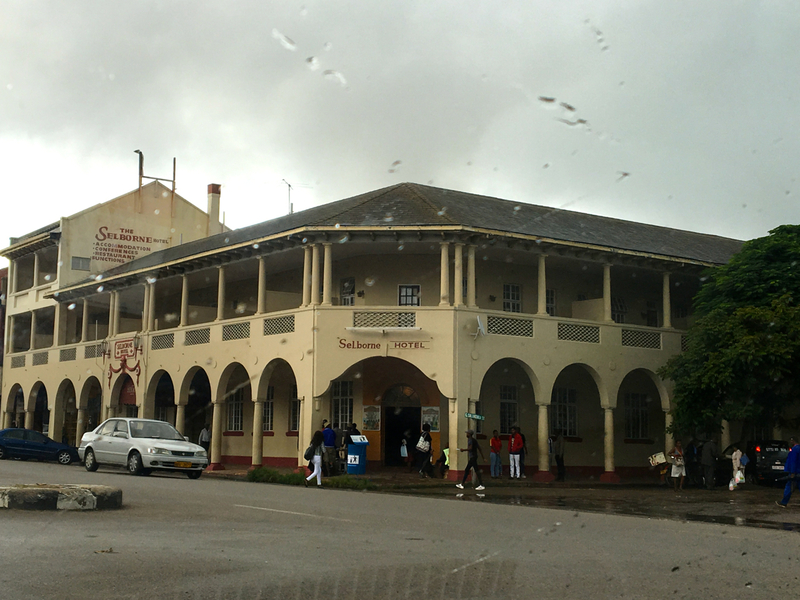 I ask a friend, who shows me around the centre and the suburbs, about hotels in Bulawayo – where should a tourist stay? 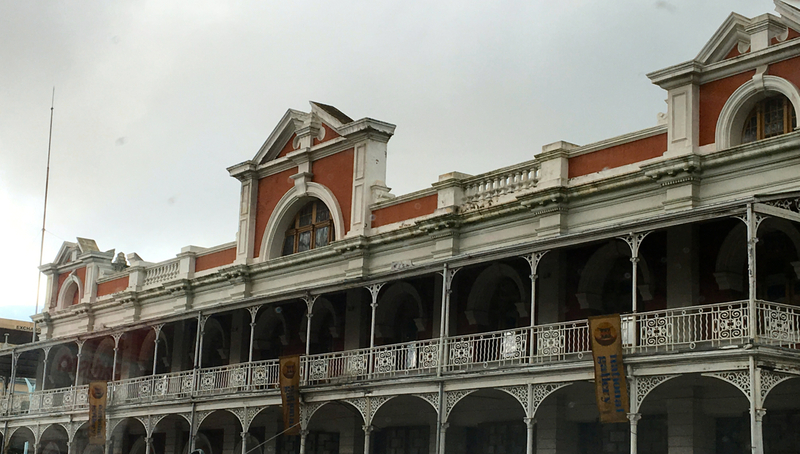 “Not in a hotel – I’d stay in something smaller … more private,” she says as we head out into the drenched suburbs. 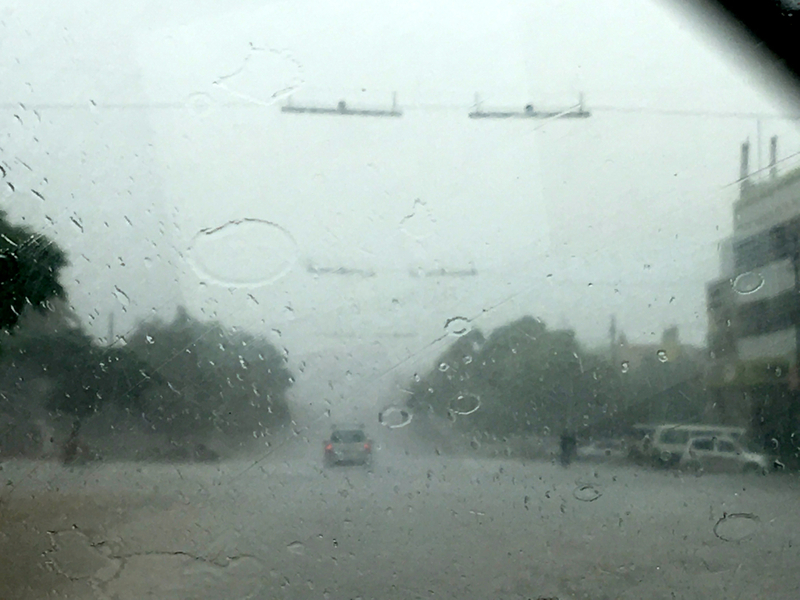 We are in a little car with its wipers in full stretch. I realise I have forgotten the power of rain in Africa. We dodge smudged pedestrians, and have to shout to make ourselves heard as a thousand impala hooves pummel the roof. The further we get from the centre of town the worse the potholes become. They lie dangerous and camouflaged beneath the rain-river roads that link the private homes back to the city. Is my friend bothered? No! But I am … a small, ancient Nissan does not seem the ideal transport choice when faced with the people-snatcher potholes of Bulawayo’s suburbs. Besides, I’m fresh from Surrey where just the possibility of lightly-pimpled Tarmac demands multi-storey four wheel drive. Thankfully my friend, a local from top to toe, is at the wheel. By late afternoon, the rain subsides. 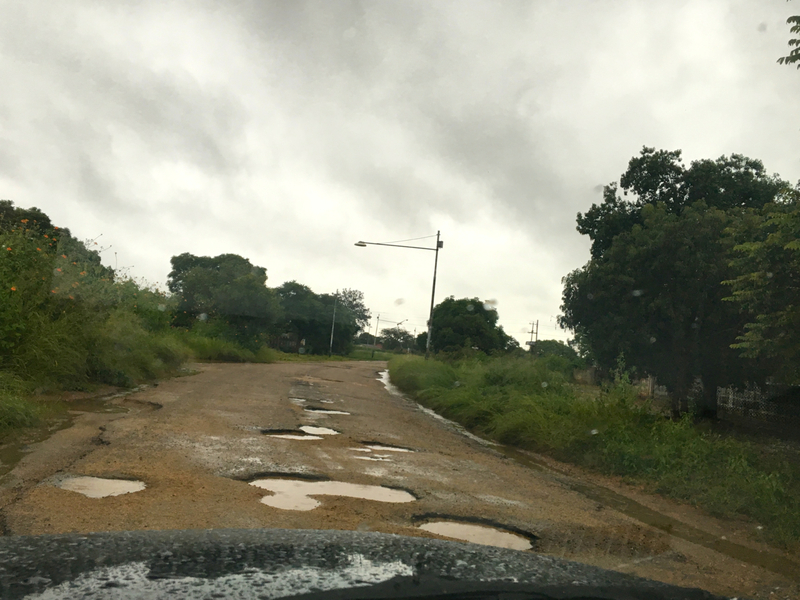 The drive back, along a lesser-potholed road, is ‘easy’ … by Zimbabwean standards at least. Home for the night is across on the other side of the city. It’s my first taste of generous, Bulawayo hospitality. There are two power cuts that evening but they are only brief, and no surprise given the conditions. 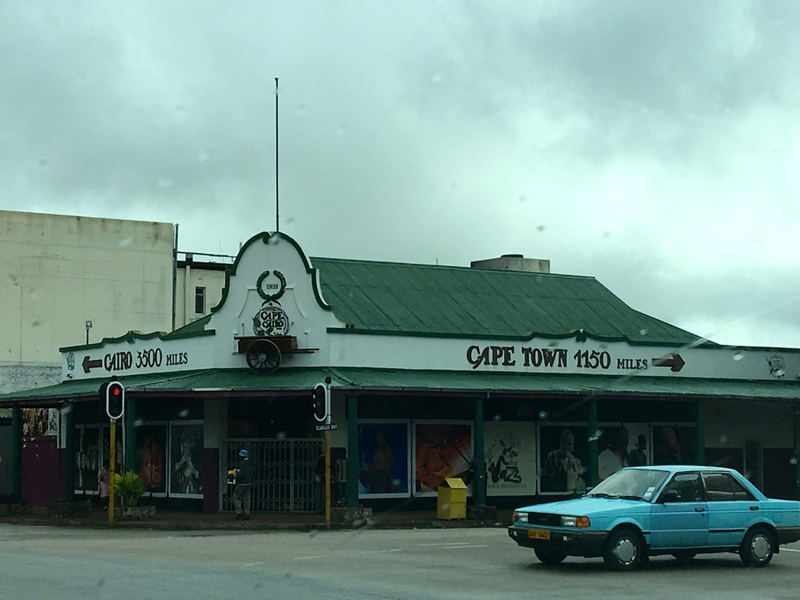 The next day is brighter but even so, as in Harare, I take my photographs from the car. It seems sensible with the big birthday only hours away. 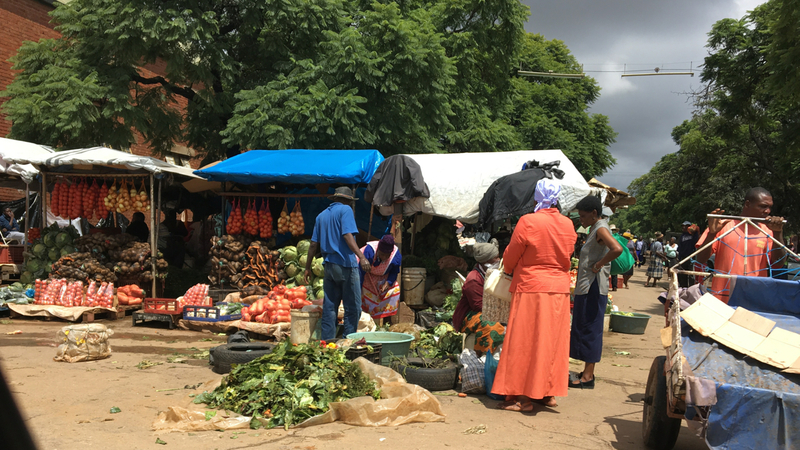 Street vendors around the city seem confident and their produce looks fresh. There are customers and there is colour … although, in some cases, business does look less brisk. We visit one of the out-of-town centres where there’s a big supermarket and a mall of small shops, some doing better than others. Lunch is on the verandah of a lovely restaurant in the suburbs, followed by a stop in a craftwork shop surrounded by garden – one of the pockets of excellence hidden around the city. 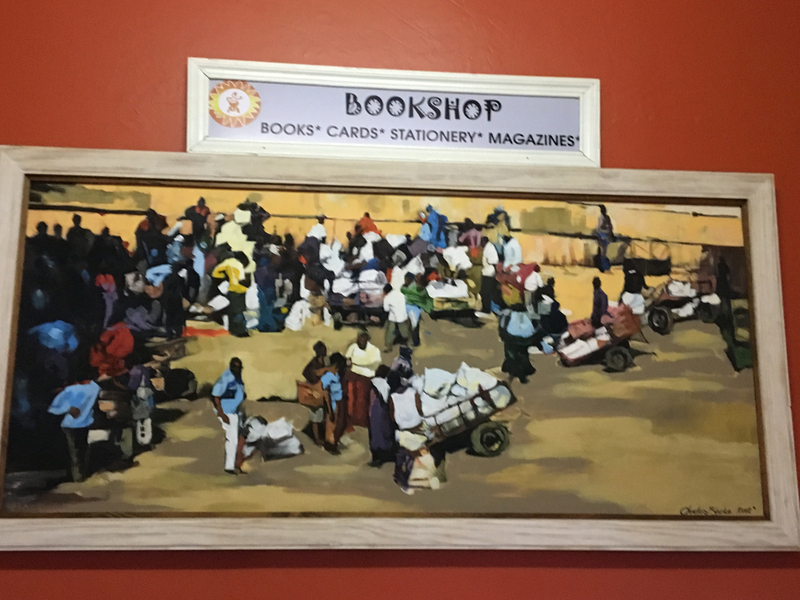 Also tucked out of sight is a silversmiths, Zuri, which produces fine, original jewellery from a small workshop … another sparkle on the tired frame of Bulawayo. 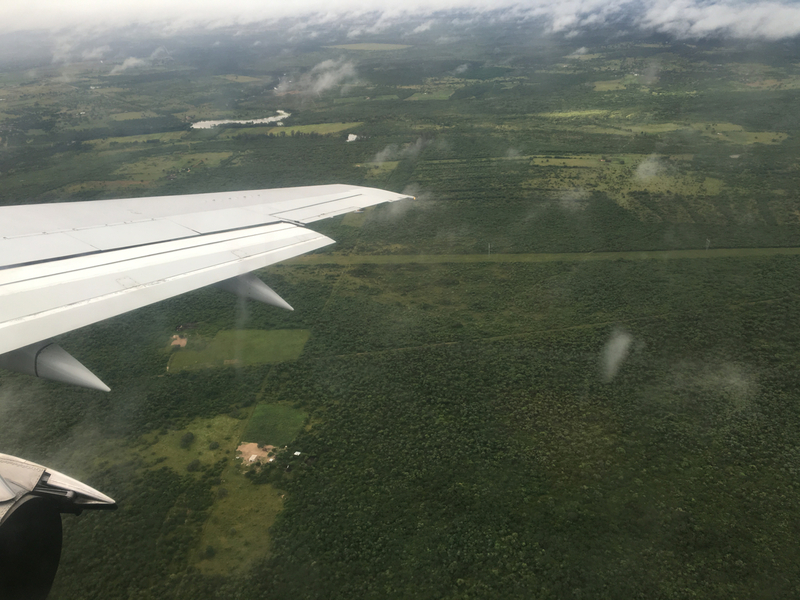 That evening I leave from a crowded airport on an aeroplane that is larger and newer than the one we arrived in, and full to capacity. The birthday bash is the next day. There are no balloons or bunting in the Bulawayo I say goodbye to. This should link to an excerpt about the history of Bulawayo from the book Zimbabwe Cry for Hope. 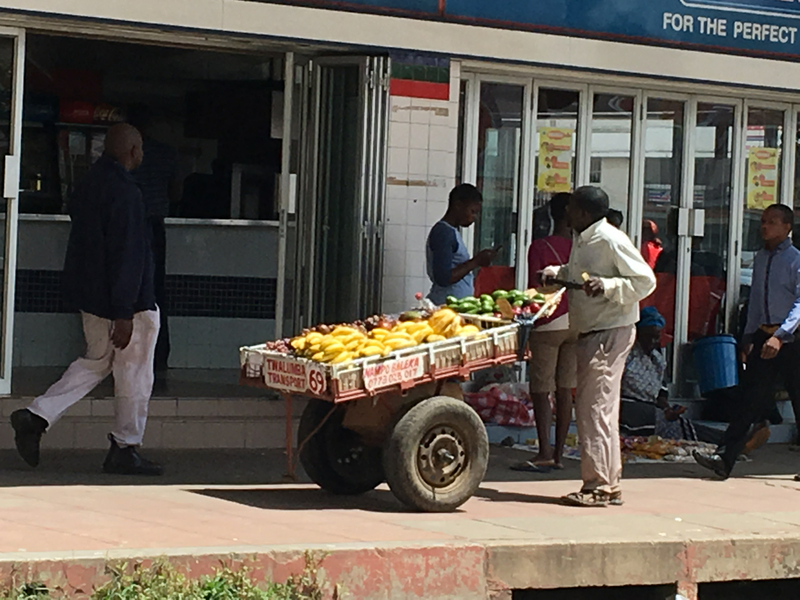 This entry was posted in Bulawayo, Zimbabwe and tagged Bulawayo, Matabeleland, potholes, rain in Africa, Zimbabwe, Zuri. Bookmark the permalink. … don’t know what to add, except thanks! Sooo interesting. Thank you for taking us to unusual places. Loved this, Georgie! Your account was my first ‘visit’ to Bulawayo. 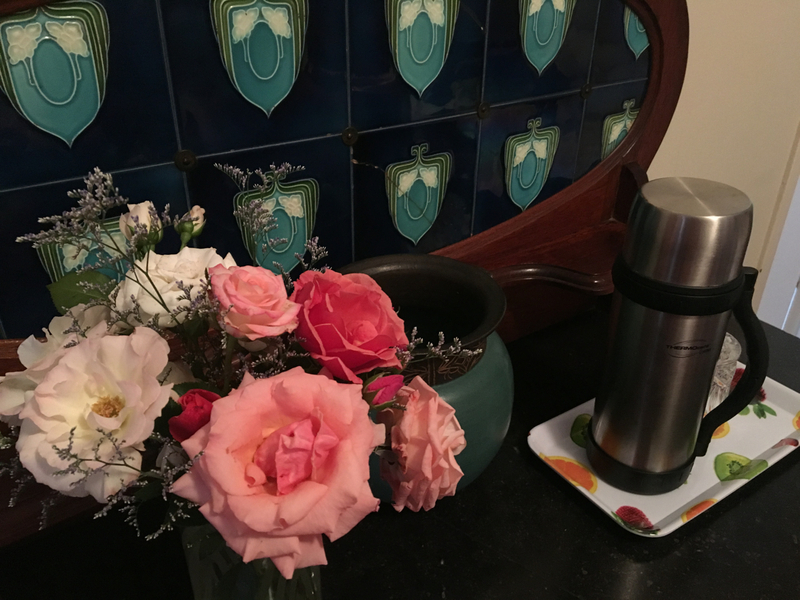 So pleased to have your company Margie – thanks!